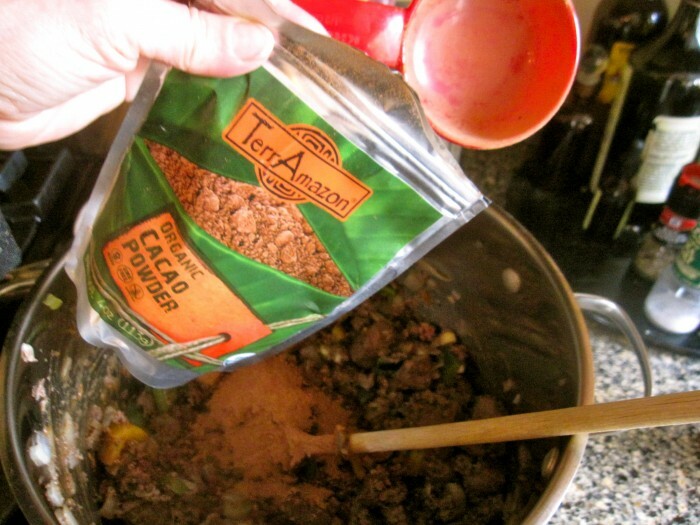 A couple of weeks back, Jessica Webster wrote an article featuring a recipe for Texas Chili. Previous to this, I had planned to write a meaty chili recipe for the paper myself, to complement remote-driven Super Bowl entertainment; chili and chicken wings are to the Super Bowl as turkey and stuffing are to Thanksgiving. I contacted Jessica wondering if another recipe would be excessive chili coverage. Tequila and beer add layers of heat and smoke. She responded that this was “totally fine — so many different takes on chili”. Indeed, there are chili societies and chili competitions too numerous to count. A reader once wrote from North Carolina informing my recipe for quinoa chili took home first place at a local chili cook off — I was glad to be of service. 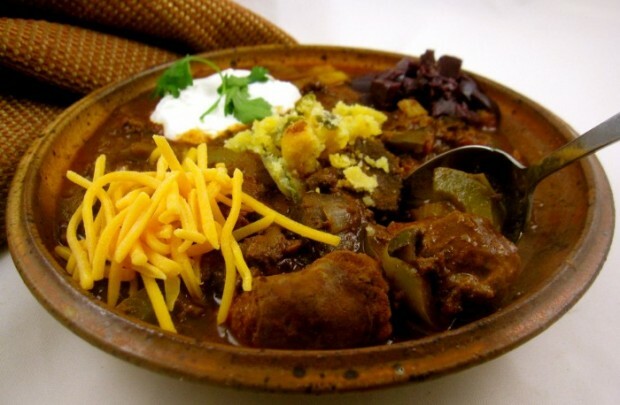 And I’ve a friend who has an entire file devoted to chili recipes, so indulge me as I add another recipe to the heap. At first glance, the ingredient list looks daunting. But take a second look—fully half of the ingredients may be idle squatters in your cabinets, begging to be used. And aside from searing beef and sausage, there’s no technique involved. Once you get the ingredients in the pot, just remember to give a stir from time to time so the bottom of your pot doesn’t scorch. Unsweetened cocoa add a velvety, slight bitter layer of flavor. Most chili recipes call for chili powder, beans and tomatoes; a trio that some consider mandatory in chili. Not necessarily so. Jessica’s recipe is classic Texas-style, and doesn’t include beans or tomatoes. The chili flavors in her recipe are derived from the combination of dried chilis she simmered then pureed, not the ubiquitous powdered version. After all, chili powder is simply pulverized, dried peppers sometimes combined with other Southwest seasonings. With the plethora of other spices I used in the recipe below, my recipe did not suffer from its omission either. In the following recipe, let your choice of seasoned sausage, preferably a Southwest-style, work overtime in the recipe. I’m an admitted chipotle pepper junkie, so I purchased chicken-chipotle sausage to get that other layer of smoked pepper flavor I crave. If you’re not using that type of sausage, chopped chipotles to taste from the can is a fine idea. Unsweetened cocoa powder adds a velvety, slightly bitter flavor to the pot, working a good bit of black magic into the brew. Beer and tequila (or mezcal) add layers of heat and smoke, depending on the brand you use. 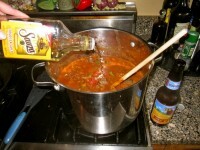 For a more pronounced flavor, add the beer and tequila in the last 30 minutes of simmer time. 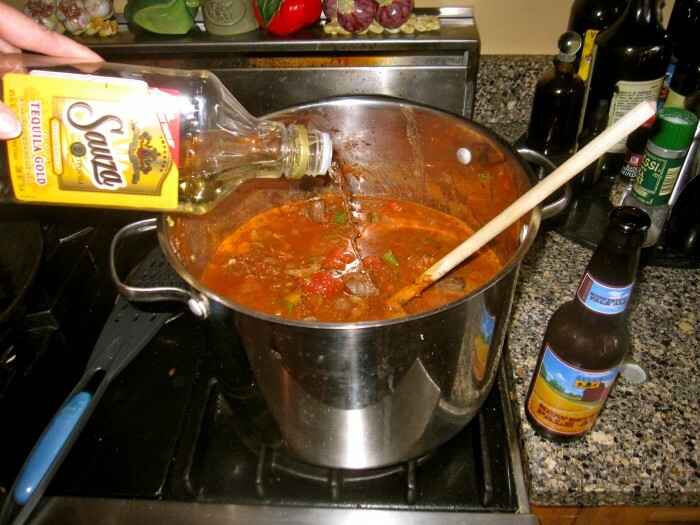 As with wine, cook with the tequila and beer you enjoy drinking straight up. Keep things super casual on game day and forgo the spoons; use tortilla chips as the eating utensil, creating a dish that’s a cross between chili and nachos. The spices used in the following recipe were inspired by “Rainwater Chili”, a recipe from Sarah-Leah Chase’s Nantucket Open-House Cookbook (published 1987). I served the following recipe in bowls topped with crumbled jalapeno-cheddar cornbread (purchased from Whole Foods), shredded sharp cheddar, sour cream, chopped kalamata olives and cilantro. Chopped tomatoes, onions and avocado would also be appropriate toppings. In a heavy-bottomed skillet, heat the tablespoon of oil over medium-high heat. Sear sausage and beef until browned on all sides. Remove from heat and reserve. In a large, heavy-bottomed pot, heat remaining oil over medium heat. Add the onions and cook, stirring, 8 minutes or until fragrant and wilted. Stir in jalapenos, poblano and bell peppers and garlic and cook, occasionally stirring, 5 minutes. Stir in cumin, oregano, paprika, cinnamon, coriander, and cocoa powder. Cook a minute then add ground beef, breaking up with a fork and stirring into mixture. When beef has lost its raw look, stir in tomatoes, tequila (or mezcal) and beer. Bring to a boil then reduce heat to low; return sausage and beef to pot and simmer, occasionally stirring and pressing whole tomatoes with the back of a spoon, 1-2 hours over low heat.